The night before I was supposed to be induced I was so nervous and excited I could barely sleep. We'd chosen to move forward with inducing at 39 weeks because I'd had a fast labor with my first and there was concern, living an hour from the hospital, I might not make it if I went into labor on my own at home. The hospital had me scheduled for a 7:30am induction but asked that I call an hour before to make sure they had space available to take me as my pregnancy was not high risk. That morning, I woke up and got ready, had my hospital bags loaded, had left kiddo with the grandparents, and was ready to do this thing! Then came the soul crushing. I called the hospital to confirm my induction time and they bumped me! They said they'd had more women admitted than expected and they hoped they could take me by noon. After 39 weeks of growing a baby and being so excited that today was my day, that postponement nearly broke me. The mister suggested we go get breakfast and slowly make our way down to the city, maybe even sneak in a movie. Sweet as he was for trying to distract me, I was hell bent on having a baby and could focus on NOTHING else. I was moody and totally distracted and poor Aaron had to put up with me like that. We finished breakfast and found ourselves hitting up the movie theater for a matinee, only Han Solo could convince me to postpone baby day! In the middle of the movie the hospital called and I rushed excitedly to the hallway fully expecting them to tell me to come now! Nope...another postponement...maybe 2:00. We finished the movie, got lunch, attempted to nap in the park, then another call came "we might be able to take you closer to 5:00.". I told them I'd be quick, they wouldn't even know I was there! But no dice. Poor Aaron had drug mopey, grumpy, angry, pregnant me around all day trying to distract me and was so incredibly nice about it. He recognized there was nothing that was going to take my mind off the fact that I just wanted to have a baby and it felt like this just wasn't happening! We wandered around the mall, contemplated just going home, and then I got another call "can you be here in an hour?" YES! Absolutely! On our way over we stopped at Jamba Juice, got a smoothie with an energy boost, picked up some protein shakes for Aaron, and were FINALLY off to the hospital to have a baby! I got checked in, threw on my hospital gown, and was totally ready to have this baby! My nurse, Holly came in, got me all set up with monitors, confirmed I was starting at 3.5 cm 80% effaced, and started my pitocin at 6:00pm. Contractions started but weren't intense and weren't really progressing me so my water was broken at 8:30 to get things moving. By 10:00 pm I was dilated to 5cm, contractions were getting more difficult to handle and coming more frequently. 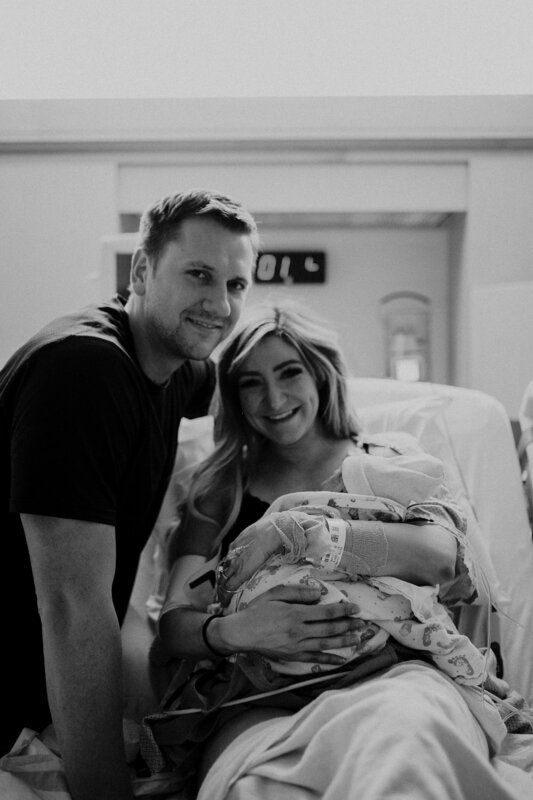 Our amazing photographer, Amber Dehaas (seriously check her out if you're in Utah) arrived and began documenting, which made the impending birth feel so much more real. Side note: I was kind of unsure about having a photographer present for the birth because, well, there's a whole lot on display! But I'm so so happy that I had Amber there to capture these moments! I was totally comfortable and she became another cheerleader for me which I needed. She captured so many moments and emotions I never want to forget. 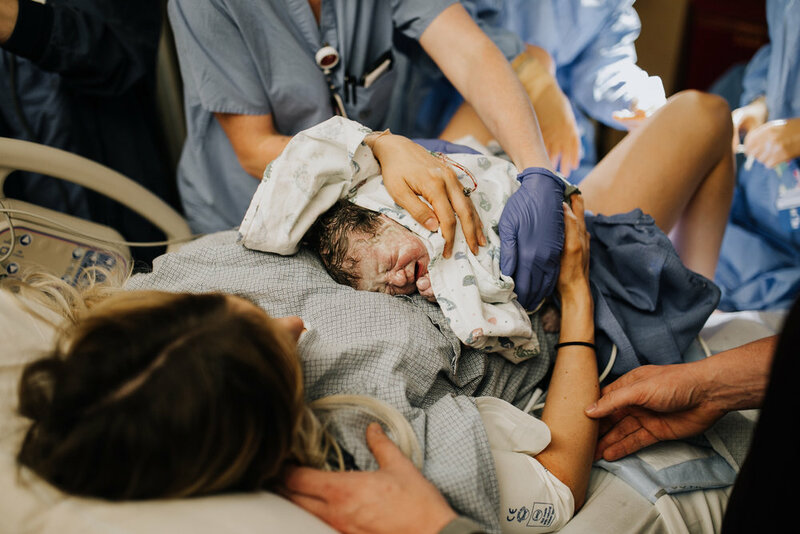 All the planning, the many months of enduring the many discomforts of pregnancy, they were all coming down to this moment when our little girl would arrive. The contractions were getting pretty rough, I'd been handling them fairly well as long as I was standing, using Aaron to help take some of the pressure out of my low back. He was amazing letting me lean on him, telling me over an over again that I totally had this, and letting me squeeze his hand with everything I had. Eventually, I opted for a light epidural. I wanted to still be able to move and to feel the contractions but I needed to take the edge off so I could be focused instead of panicked since contractions were now coming every minute. They gave me a light dose and then gave me control to up the epidural meds as I felt I needed them. This is where things got a little crazy. A few doctors came in and started watching me monitors, Holly kept asking me to change positions and I could see concern on her face. Baby's heartrate began dropping with every contraction, and with them being 1 min apart, that was a lot o decelerations. Changing positions wasn't helping and the doctors explained that it seemed that with each contraction baby was compressing her umbilical cord. Since my water had been broken baby just didn't have that extra cushion for her cord. They decided to place an internal fetal heartrate monitor and started a process to refill my uterus with fluid, I didn't even know this could be done! In addition they gave me medication to stop my contractions which stressed me out because, didn't I just spend the last few hours connected to IV pitocin to get those contractions? Then, Holly started mentally prepping me for the possibility of an emergency C-section. I wanted to stay calm, but as she started walking through the process and what to expect I broke down. I needed my baby girl to be okay and I was so worried things would take a turn and I would feel fully responsible. I watched those monitors so close, and just cried each time baby's heartrate dropped. As my uterus re-filled with fluid, contractions slowed, and I continued trying to find a position more ideal for baby, and then...the decelerations stopped! And OMG, I was so thankful. I was afraid to move, afraid to use the epidural, afraid to do anything but breathe through the contractions as they came. The hope was that, even though I'd been given meds to stop my contractions so baby could have a little break, I'd continue dilating and progressing. If I didn't, the next step was C-section. Over the next couple hours the epidural was wearing off, the contractions slowed, and baby's heartrate stayed stable. Quickly though, contractions were back with a vengeance. They started coming every minute and they were so painful. I was too afraid to hit that button to dispense more pain meds through the epidural though because I didn't want to do anything to stress baby! Things were getting unbearable. Around 1:20am, Holly came in and decided to check and see if I'd progressed at all. "You're at a 10, baby is still a little high but I think she'll move down, let's get pushing!". Things got very busy very quickly as people flooded the room and prepared for baby. I was in so much pain with every contraction, I asked Holly if I should try to up my epidural meds first since I hadn't been using them and she just told me, "you'll feel better once you're pushing, there's not really time to wait for the epidural to kick back in, you can do this". I had monitors and tubes coming out of me everywhere but they quickly had everything prepped and ready. Again, they said baby was a bit high but they expected pushing would help move her. I took a deep breath and pushed once and they all all looked surprised as the doctor said "yup, she's down! Keep pushing!" Another push and her head was out, one more and baby was here! I couldn't believe how fast she came! They handed her to me, she started to cry, and I was completely overwhelmed with gratitude for her safe and easy entrance into this world. She was here, she was healthy, and she was 6lbs 15oz. of absolute perfection! Her little head was covered in thick dark hair, she had the tiniest little hands and feet, and I was totally in love. I got to see that look on my husband's face again, the one I saw when Hudson was born, that just makes my heart explode. It was all overwhelmingly surreal and I'll remember those feelings forever. As we held her and cuddled we finally settled on her name, after having debated on it for months, Olivia Blake Daniels. The doctors gave me the good news that nothing tore and recovery was going to be pretty easy this time! This blew my mind since baby came in just 3 pushes! I really feel like staying active and healthy through my entire pregnancy contributed to how fast and efficiently she was delivered. After an hour or so it was time to move to our room, I finally got unhooked from most of the many many tubes and wires which felt so good. Holly was really surprised when I stood up and got in the wheelchair on my own, as were my nurses when I was able to get up on my own to use the bathroom through the night. I'm telling you, those sumo squats all the way up to 39 weeks do you a lot of good! From there we went to our room and spent the rest of those early morning hours sleepily staring at our new little baby in total awe. Photography by Amber Dehaass Photography (@amberdehaasphotography). She's amazing and I highly recommend her if you're having a baby in Utah! Not only did she perfectly capture our birth story, she also became part of my birth squad. So lucky to have had her there for this huge event!